My first-grader, Libby, came home from school a few weeks ago in a panic. "Mom! Mom! It's my teacher's birthday this weekend. We HAVE to make her something." I quickly thought through the options of things I could make, taking into account what ingredients I had on hand, and quickly settled on these Pumpkin Muffins. (The recipe makes two dozen muffins, so we were able to keep half the recipe for ourselves. Yay!) Libby and I mixed them up, baked them and then sent them off to school the next day. Evidently, they were a hit with Libby's teacher. If you love pumpkin-flavored treats, this will make you very happy! Source: Adapted from my trusty "Betty Crocker's New Cookbook"
Heat oven to 350 degrees. Grease muffin tins and set aside. Mix pumpkin, sugar, oil, vanilla and eggs in a large bowl. In a second bowl, whisk together remaining ingredients. Pour flour mixture into wet mixture and stir until combined. Pour batter into prepared muffin tins. Place in oven and bake for 15 to 20 minutes, until a toothpick inserted in the center of a muffin comes out clean. Cool 5 minutes in the pan on a wire rack. Loosen muffins from pans and remove to wire rack until completely cool. Tip: I adapted this from a Pumpkin Bread recipe. To make bread instead of muffins, divide mixture between two 8-inch loaf pans. Bake for 50-60 minutes. Cool for 10 minutes in pan on a wire rack before removing loaves to wire rack to cool completely before slicing. ... Make muffins. They bake and cool much faster! I just made these for my son's preschool class Thanksgiving party tomorrow and they are delicious. Thank you!! very, very good!! 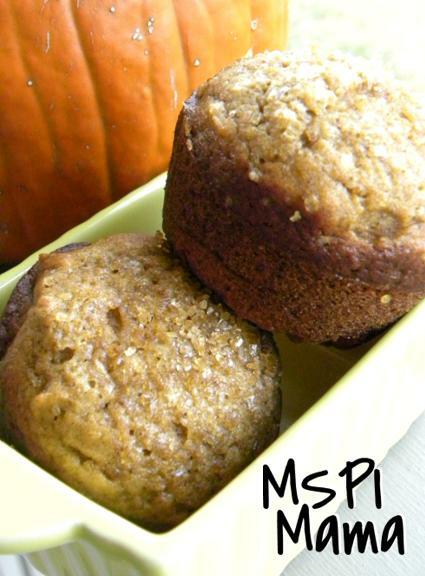 For an extra special treat, put a little cream cheese frosting on top (the MSPI safe kind :). These are soooo yummy. Super soft, fluffy...it's like eating pumpkin pie! Love them! I made these last week and love them! My 20 month old daughter loves them too. Thanks for all the help! Thanks for the simple and yummy recipe! This is a life savior for a dessertaholic that's feeling deprived. I followed the recipe except I added Enjoy Life dairy free chocolate chips. I put cake icing on some of the muffins to make it kid friendly and kept mine plain and it was wonderful!